Braid a climbing rope bridge for your rat, other rodent or bird cage! Cut a scarf into three long pieces and tie the end of each piece to a ribbon tie, jump ring, lanyard clip or shower curtain ring. Braid the three strands, consider adding beads or toys to the strands as you braid and cut the rope to the length needed to be taunt in your cage as a bird perch or rope bridge. 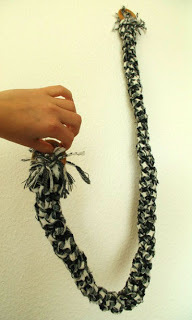 Knot the end or attach a second fastener to the end and hang the rope in your pet’s cage.